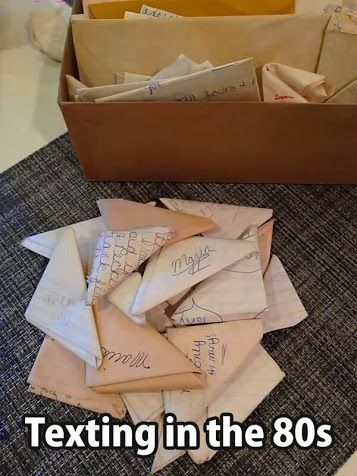 In some ways, relationships seemed easier back then. I don’t know if they were for sure but my memory of things has a fuzzy haze to it and I don’t remember having issues like the ones we have now. There wasn’t cyber anything…no way for someone to splash their dirty laundry or yours publicly for all to see. If something big was going to go down, then you were going to have to show up in the alley after school to see it happen. No video evidence would be left, tweets or status updates to tell the story. Friendships feel more complicated today. We are communicating electronically. Anything we say is potentially public information. A quick screen shot means our private conversations can be flung far and wide by the recipient. What you meant for one pair of eyes can be broadcast for lots of eyes to see in a few moments. In some ways I think this requires us to be more savvy in our relationships. We need to be thoughtful not only about who we are friends with but how we interact with them. Do we trust them completely? Should we be more guarded? We feel connected to more people but perhaps in more shallow ways. It’s confusing for me at 40 and I would venture a guess that it’s tricky for our kids too. I struggle with how to navigate waters with my children that I’m just learning myself. I keep thinking that my age group, as parents, is in some sort of strange “in between”. We didn’t have technology as part of our relationships growing up so we are learning it now. Our parents didn’t have this particular challenge and our children won’t have it either as they will have grown up in this age of technology. I pray all the time that I’m not screwing this up big time. At any rate, what does this have to do with friendship? Quite a bit actually. The change in communication styles/habits has deeply affected how we relate to others and that change is here to stay. Friends are important to us at this stage of life, just as they have always been. 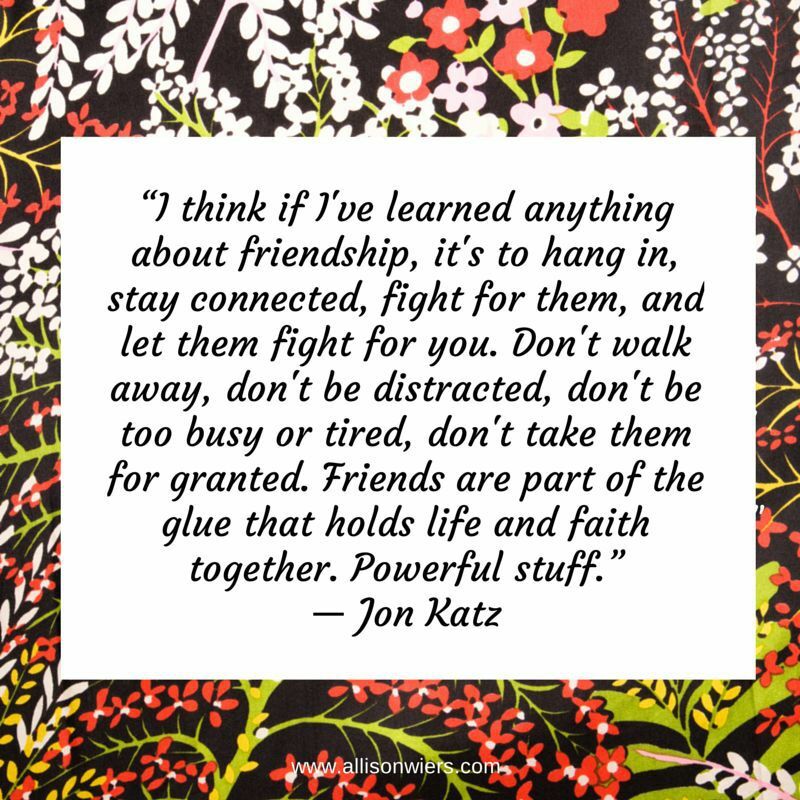 The challenge I find is that I have less time and energy to devote to friendships. I love people and enjoy spending time with other women but am working very hard to guard the margins of my life. In the end I can rely too heavily on electronic “friendship”. I feel like I’m keeping up with people I love and enjoy when I see their latest Facebook status. Texting is a comfortable and easy way to check in quickly while I multitask, checking items off my list while being a “friend”. The issue of lack of time pushes me to relegate friendship to the fringes of my life. I believe strongly that my main priority needs to be my husband and children. Beyond that I have a home to keep up with and jobs to do that bring in income. We are blessed to have lots of family in the area and the sum of all of that leaves little room for girl time. So how do we keep up with friends that offer us something that the other relationships in our life can’t? Find time/make time to grow friendships. This can be lunch, a quick cup of coffee, a glass of wine and Facetime or even exchanging Voxer messages. Put effort into real relationships (meaning person to person, talking and relating) and not just quick online interactions. Evaluate the relationships you have to determine if they are healthy and worth the effort you are putting into them. You may need to pull back from some toxic relationships. I’m sure there are other great ideas too. Maybe you would share an idea in the comments? In the end, relationships are built just like we did it 20 years ago. You show up, spend time together, voices mingled, hurts shared, belly laughs ringing out and that can’t be done through technology.